This Spiral Tube Slide mounts to a Penthouse that sits on top of your Monkeybars. It's fully enclosed for sliding fun. With a 360-degree turns it makes you feel like you are in a hurricane slide, it's especially great for smaller backyards. 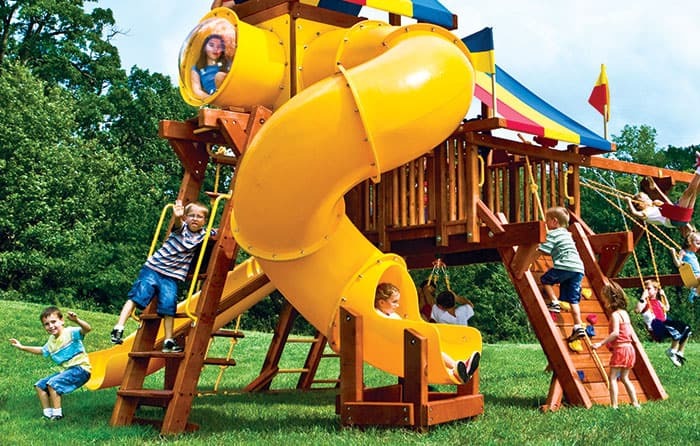 Pricing varies depending on color and which playset you are attaching it to, see Playset Specialist for details. This Slide is most commonly attached to a Penthouse (SkyBox) on Rainbow's Rainbow & King Kong Series Playsets.